Ali Kerim Bey — Jovially ironic and cheerfully vice-ridden, the Istanbul station chief has produced enough sons with a variety of women to populate the entire Turkish branch of MI6; he is clearly a man after 007’s own heart. Indeed, in the movie he seems to be one of the very rare male characters who could be described as an actual friend of Bond. (In the novel, Bond’s ongoing admiration for Bey reads to modern eyes like an out-and-out man-crush.) The character was reportedly inspired by Ali Nâzım Kalkavan, an Oxford-educated Turkish shipowner connected to the English film industry whom Ian Fleming met while researching the novel. Film acting great Pedro Armendáriz might have hailed from parts significantly west of Istanbul, but he had just the right playful, larger-than-life presence to embody Ali Kerim Bey. The American educated Armendáriz had stumbled into a career as major star in his native Mexico as a handsome youth. He also appeared in a number of north of the border films in Hollywood, and it was none other than the legendary director John Ford who suggested the half-Anglo Armendáriz to Terrence Young for the part of the half-English Kerim Bey. 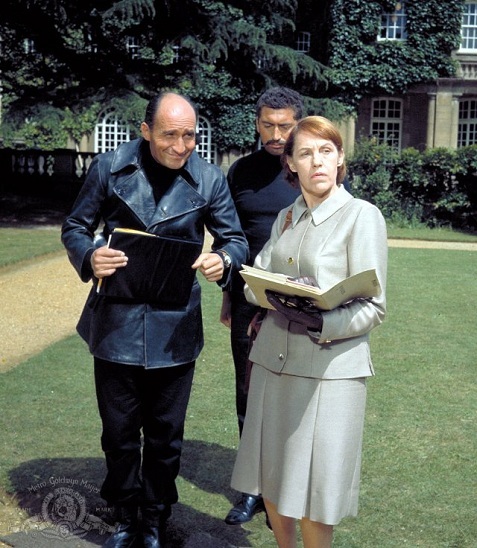 Major Boothroyd — The armorer, eventually known simply as Q of Q Branch, actually did appear in “Dr. No,” but don’t feel bad if you missed blink-and-you’ll-miss-him original Boothroyd/Q Peter Burton; we did too. Unable to return because of a prior commitment, veteran working actor Desmond Llewellyn replaced Burton in the second Bond film. Though Llewellyn’s debut lacks any humorous by-play, the production team apparently realized they had something with the droll Welshman. Things would be different next time. “From Russia With Love” is distinguished by a group of genuinely fascinating bad guys who were, in turn, played by some of the most impressive performers in the Bond cannon. Kronsteen — The brilliant chess player who develops the original plan is able to defeat a chess opponent in a matter of a minute, even while risking death by not immediately answering SPECTRE’s call. Nevertheless, he eventually falls prey to Mr. Blofeld’s very strict personnel policies. Kronsteen was portrayed by Vladek Sheybal, a Polish-born newcomer chosen for his memorable face and performing style. He would remain a consistently interesting and watchable character actor in English productions until his death in 1992. Rosa Klebb — In the novel, the toadish Klebb is the depraved and, naturally, lesbian operative of the Soviet SMERSH. In the movie, she has defected to SPECTRE, but that fact has been kept hidden by the Kremlin, making her just the person to deceive the communist but otherwise innocent Tatiana. With the poison tipped knife in her shoe (SPECTRE standard equipment, it seems), Klebb is a figure of pure bile, yet believably human. Donald “Red” Grant — The utterly cold-blooded killer who meets his end after one of the famous hand-to-hand battles in movie history is a pure psychopath or perhaps, as we’re told, a homicidal paranoiac. The novel goes into some detail describing his apparently inborn propensity for murder and cruelty, but from the pre-credit sequence on, the movie makes that clear enough. The film subtly establishes the emptiness inside Grant by making him silent throughout the film as he shadows Bond and helps keep him alive long enough for SPECTRE’s evil plan to take hold. He finally speaks, but not as himself, when he meets Bond under the guise of a recently deceased MI6 contact. As in the novel, his repeated use of the English boarding school expression “old man” becomes a bit of a tip-off to Bond. He also conveniently explains the entire plan to Bond before trying to kill him, which is always helpful behavior in a villain. Young Bondians are often astonished to learn that the gigantic, strapping, red-haired Grant is the very same human being who portrayed the scrappy, not-quite-gigantic brunette seaman, Quint, in “Jaws.” Shaw was clearly one of the better actors tasked with killing James Bond and Grant was far from his only memorable movie bad guy. He was the chillingly ruthless Doyle Lonigan of “The Sting,” the uncompromising subway hijacker, Mr. Blue, in the original 1974 “The Taking of Pelham One Two Three” and the most imposing Sheriff of Nottingham ever opposite Sean Connery’s middle-aged Robin Hood in “Robin and Marion.” Between those films and his Bond gig, Shaw won an Oscar for his portrayal of King Henry VIII in 1967’s “A Man for All Seasons.” The master thespian was also a novelist and playwright, perhaps best known today for the play “The Man in the Glass Booth,” inspired by the trial of Nazi war criminal Adolph Eichmann. He died while still at the height of his movie fame in 1978. With such a large and notable cadre of bad guys, you’d think we’d have the notable bad guys covered. However, we should give at least a nod to the Soviet paid Bulgar assassin Krilencu, whom Kerim Bay does away with as he is looking out of a poster for an upcoming Bob Hope/Anita Eckberg comedy. The assassin was played by the late Hungarian-born actor and stunt man, Fred Haggerty. After the fairly wanton killing of Prof. Dent last time around, Bond is on slightly better behavior. He does, however, offer to perform the cold-blooded assassination of Krilencu. Instead, Kerim Bey performs the honors in what is arguably a case of “all’s fair” in the war between the two men. We suppose you could make a case 007 doesn’t actually have to garrote Red Grant to death at the end of the fight in the train, but we’re willing to chalk that one up as reasonably pure self-defense and some justifiable anger for messing up an enjoyable evening. The really elaborate doodads will be making their debut in “Goldfinger.” However, Boothroyd/Q does give Bond an extremely nifty and useful briefcase which the spy describes as a “nasty little Christmas present.” It features a folding AR-7 sniper rifle, hidden rounds of ammunition, a throwing knife that pops out of the side, an innocent looking can of talcum powder that holds a tear-gas canister, and hiding places for 50 gold sovereigns, always handy for potentially life-saving bribes. Believe it or not, with enough cash you can purchase a suitcase claiming to be the actual Bond case from the firm of Swaine Adeney Brigg. We’re wondering if those sovereigns would cover the cost. After the success of “Dr. No,” the famously thrifty Cubby Broccoli was prepared to spend a bit more on travel-related expenses. 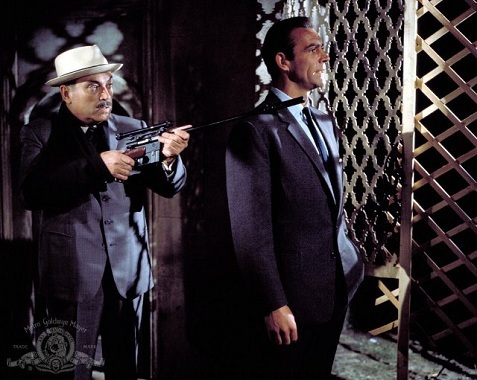 However, while many sequences were filmed in Istanbul, Venice and elsewhere, a surprising number of sequences were actually shot in Sean Connery’s native Scotland and at London’s Pinewood Studios. Again, director of photography Ted Moore does a fantastic job of creating a sumptuous look on a relatively lowish budget, give or take some of those inevitable obvious early sixties back-projection shots. Befitting the reputation of “From Russia with Love” as the most straightforward Bond film made in the 20th century, the sets are, on the whole, a bit more restrained than in future entries. However, even with legendary production designer Ken Adam taking a break from the series, they range from beautiful to spectacular. Syd Cain had worked in an accidentally uncredited capacity as the art director on “Dr. No” — rather than expensively redo the credits, Cubby Broccoli gave Cain a solid gold pen instead — and he was more than up to the task of production design. Still, the villain’s lairs get upstaged this time. Yes, there is Blofeld’s rather lavish office on his yacht, but it’s a relatively restrained affair. Even his aquarium is normal sized and only houses three ordinary Siamese fighting fish. The oft-spoofed SPECTRE Island training facility, with its live shooting galleries and deadly dojos, is suspiciously similar to an elaborate multipurpose silent film set used to comic effect in, believe or not, “Singin’ in the Rain.” Easily the most spectacular set this time around is the room where Kronsteen wins his chess game. The huge Venetian frescoes that adorn the room remind us of where we are and spice up what might have been a somewhat dry scene. By the early sixties, teasers were a common technique used to persuade the ever-growing TV audience to sit through commercials, and so it seemed like a natural way to “hook” a movie audience right away. Producer Harry Saltzman had come up with the idea that the second film should open with the apparent death of James Bond. Furthermore, Stanley Kubrick’s Oscar-winning film of “Spartacus,” had given the filmmakers the idea of an extremely rigorous SPECTRE instructional camp where death was the equivalent of a non-passing grade. Thus, the thrilling James Bond movie pre-credit sequence, which eventually became as much a part of the series as the girls and the guns, was born. This time, we meet psychopathic, eerily silent professional killer Donald “Red” Grant who encounters the apparent Mr. Bond in the spectacular garden of an English mansion and dispatches him with the help of some garroting wire secreted in his watch. We quickly realize the entire thing is a very deadly war game when one of Grant’s superiors pulls a mask off the body, revealing a mustachioed man who should have considered the dubious employment practices of SPECTRE. With a bigger budget came more frequent and more elaborate action sequences. Undoubtedly the most famous action scene in “From Russia with Love” is the climactic fight in Bond’s private room on the Orient express. The fight, rather brutal by the standards of its time, wowed audiences but it took a lot work as the use of stunt men was limited, allowing for a greater degree of realism than audiences were used to. The scene must have given Broccoli and Saltzman at least a touch of indigestion and it is supposed to have taken some three weeks to choreograph and film — enough time to shoot an entire movie. The effort certainly paid off, however. A later boat chase was more even more dangerous to film, though perhaps less effective for jaded modern viewers. In our opinion, Bart is not quite in the same musical league as Barry (we’re not big fans of “Oliver!” either) and his “From Russia with Love” is not one of our very favorite Bond melodies. So, the film wisely leads off with an instrumental rendition arranged and conducted by Barry, leaving a vocal rendition by Matt Monro for later. Barry adds elements of quasi-classical dramatic film music and jazz, transforming Bart’s somewhat bland melody into an exciting composition that properly sets the tone of romance and adventure. At another point, Bond risks a movie-related in-joke, which has become very “in” indeed. After shooting down a SPECTRE helicopter, he quips, “Looks like one of their aircraft is missing.” This is a reference to “One of Our Aircraft is Missing,” a once popular World War II-era propaganda film from cinephile favorites Michael Powell and Emeric Pressburger (“The Red Shoes”). Sadly, the film in question fell into public domain and has rarely been seen in any but the most battered prints for decades. There is some booze, but no actual cocktails this time. Bond — who actually seems to prefer bourbon over martinis in the novels — seems to be in more of a caffeinated mode. He orders his super-strong Turkish coffee “medium sweet” while hanging with Ali Kerim Bay, and later requests from room service that his morning wake-up beverage be “very black.” Nevertheless, Bond and his new buddy, Bey, drink an allegedly “filthy” Turkish liquor called raki at the Gypsy camp. — The poster that soon-to-be deceased assassin, Krilencu, is looking out of shortly before his last breath is for the Bob Hope vehicle, “Call Me Bwana.” Not surprisingly, the film happened to be another movie produced by Cubby Broccoli and Harry Saltzman’s EON Productions. If you’re going to give a movie free advertising, it really should be your own. 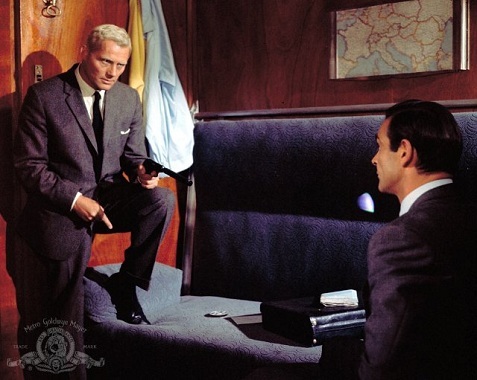 — “From Russia With Love is one of numerous thrillers to include trains in general and the Orient Express in particular. A few of the films Terrence Young and company might have had in mind as they were shooting the train sequence were Josef von Sternberg’s “Shanghai Express,” 1934’s “Orient Express,” Alfred Hitchcock’s “North by Northwest” and “The Lady Vanishes,” as well as Carol Reed’s “Night Train to Munich,” which had a somewhat Bondian-leading man portrayed by Rex Harrison. Although Agatha Christie’s novel, Murder on the Orient Express was first published in 1934, there was no film version until America’s Sidney Lumet made an Oscar winning film version, costarring Sean Connery, in 1974. Fans who saw both “From Russia with Love” and “Dr. No” might have spotted the beginning of a pattern. Bond and Honey Ryder (Ursula Andress) wrap up in the first movie engaged in some heavy movie-style petting in a small boat. Bond and Tatiana end the film engaged in some goodness-knows-what in a Venetian gondola. Whatever they’re doing may or may not be legal under Italian law, but Bond probably has a license for that as well. One last tradition began in “From Russia with Love” and it was the promise of another 007 adventure before the end credits. In keeping with the tendency of films of that era to get a bit cute with the closing “The End” title card, here it’s followed by “Not Quite the End” and then, “James Bond will return in the next Ian Fleming thriller . . . ‘Goldfinger. '” And so he did.